The anthropogenic nitrogen input into coastal waters is becoming increasingly problematic due to eutrophication of our waters. During digestion of municipal wastewater treatment sludge up to 50% of the organic nitrogen is released as soluble ammonium, whereby concentrations between 600-1000 g NH4-N/m3 in the sludge digester supernatant result. With the recirculation of this supernatant to the primary settling tank the total nitrogen input load is increased by up to 20%. Therefore this recirculation significantly contributes to the up to 70% of the input nitrogen load discharged into the receiving waters. To prevent this nitrogen recycle, a separate biological treatment of the supernatant can be integrated in the recirculation loop. Conventionally ammonia is removed via nitrification and heterotrophic denitrification, ammonium being oxidized to nitrate and then reduced with an external carbon source (often methanol) to molecular nitrogen. 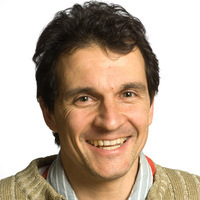 Since August 2006 Eawag is researching on the combined single stage nitritation/anammox process. In this process a part of the ammonium is oxidized with oxygen into nitrite (partial nitritation), while the remaining ammonium is oxidized biologically to molecular nitrogen using the produced nitrite as electron acceptor (see figure). The investigations on the adaptation and the kinetics are carried out in a 400 L SBR-reactor (see figure) and in small batch reactors. 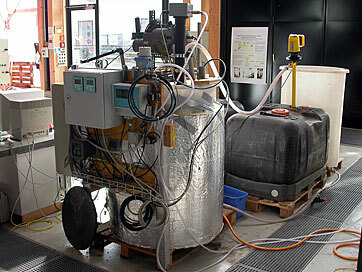 The research on the nitritation/anammox process is a currently ongoing project at the Eawag. The understanding of the whole process (kinetics, inhibitions, regulation, adaptation) is being improved by investigating the key specific growth rates and by compiling all relevant processes in a mathematical model. The research also focuses on other applications for the nitritation/anammox process, e.g. the nitrogen removal from urine. Joss A., Salzgeber D., Eugster J., König R., Rottermann K., Burger S., Fabijan P., Leumann S., Mohn J., Siegrist H. (2009) Full Scale Nitrogen Removal from Digester Liquid with Partial Nitritation and Anammox in One Reactor, accepted for ES&T. Siegrist H., Salzgeber D., Eugster J. and Joss A. (2007) Anammox brings WWTP closer to energy autarky due to increased biogas production and reduced aeration energy for N-removal, Wat Sci & Tech., 57(3), 383-388.